I have always loved the legends and folklore that surround St. Francis of Assisi, who is not only synonomous with a concern for the poor, but also the patron saint of ecology. Who knew that one day I would become just like him? Thanks to a friend and colleague for pointing this out on Facebook. This afternoon, while at the playground with my kids and neighbor, this little guy made his way towards us. I did what anyone else would do- I ran into my house, grabbed two oven mitts, and welcomed "Francis" on our neighborhood pilgrimage. Then I realized it may be best to put him back in the tree. I certainly don't think it would have been good idea for me to put him in my son's tricycle trunk and bring him home. Maybe I am not as Franciscan as I thought. "As a friend of the poor who was loved by God's creatures, Saint Francis invited all of creation – animals, plants, natural forces, even Brother Sun and Sister Moon – to give honor and praise to the Lord. The poor man of Assisi gives us striking witness that when we are at peace with God we are better able to devote ourselves to building up that peace with all creation which is inseparable from peace among all peoples." 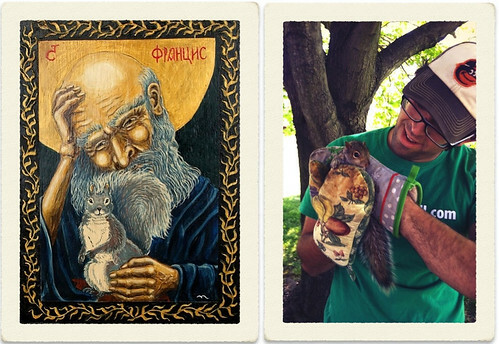 *Greek icon of St. Francis above is on acrylic, by Kris Larsen. 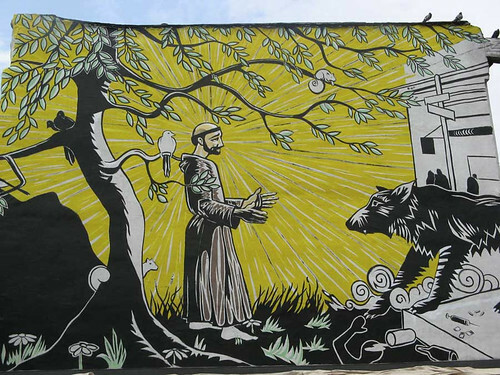 **The mural is on the wall of St. Francis Inn in Philadelphia, an urban minsitry I encountered in 2010. From website: "We are a Franciscan, Eucharistic community called to minister with the poor and homeless of Philadelphia. Formed in the spirit of the Gospel and inspired by the life and compassion of Francis and Clare of Assisi, we try to meet the immediate daily needs of the people we serve with food, clothing and hospitality."